Make sure you keep your beacon dry and store it appropriately. Keeping your registration details up to date assists search and rescue to locate your beacon in the event of an emergency. Please keep your registration details up to date and ensure you renew your registration before it expires every two (2) years. Updating your registration is free and can be done online through the registration system. If you've bought or sold a boat, you can update your details on the registration system, or contact us to provide new or change details of your beacon and vessel. 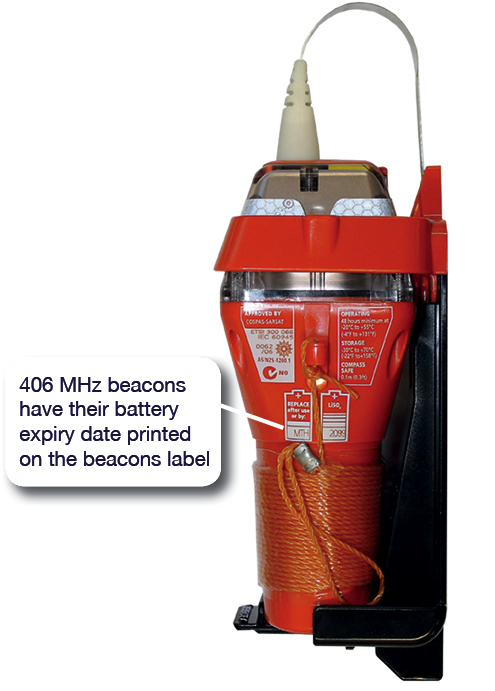 To report a lost, sold or stolen beacon, call the Beacon registration help line immediately on 1800 406 406. What are my options for when my battery is due to expire? Beacon batteries last for approximately 5-10 years. Before your battery reaches its expiry date, you should consider the options to ensure that the beacon will transmit properly in an emergency situation. Option 1. Buy a new GPS equipped beacon Why is GPS best? Option 2. Contact the beacon manufacturer for battery replacement and servicing options read more for important information about servicing your beacon. If the beacon battery was replaced or serviced by a non-certified service centre then the beacon is non-compliant for carriage requirements and there is a risk the beacon may not function correctly. Please read more about who is authorised to service my beacon in Australia. If you have used your beacon in a distress situation, contact the manufacturer or a certified servicing agent to replace the beacon battery and discuss your servicing options. This is because the battery may be depleted and the beacon may have been damaged during use. Therefore, the beacon will not be guaranteed to function correctly in another emergency situation. Every beacon has a self-test switch. Please ensure you follow the manufacturer's guidelines on how to perform a self-test and how often. Some manufacturers recommend that you self-test the beacon periodically, either once a month, or prior to a planned trip. Note: Over testing can drain the battery. For advanced users, see the beacon testing policy. EPIRBs and float-free EPIRBs must be registered with AMSA. This means the owner's personal information will be registered to the EPIRB which should deter theft. AMSA will pass on any relevant information relating to official police reports of stolen beacons. Domestic Commercial Vessel owners are encouraged to stow the unit when the vessel is 'alongside' and remount it prior to the vessel sailing.